Dr. Peck and Dr. Peterson Boyle pride themselves in one of the world’s most advanced dental treatment facilities. Dentists and patients come from around the globe to see the facility and learn his concept and philosophy of practice. Practice management consultants feature this office as they tour and lecture internationally. An integral part of our practice Dental Studio 101 philosophy and facility exude customer service. You will enter a working art gallery where someone comes to greet you by name. As a new patient, you are given a private and complete tour of the office as the staff gets to know you and your concerns. You are introduced to the entire staff and to a level of technical equipment and expertise that you would be hard pressed to find anywhere else. We are truly at the forefront of cutting edge dentistry. As you walk through the beautifully decorated facility you will be introduced to digital x-rays which reduce radiation exposure up to 95 percent and eliminate chemical waste. Dr. Peck lives in the community and is extremely environmentally concerned, as well as concerned with your health and the health of your family. You will see highly technical intraoral and extraoral digital cameras capable of letting you see what the doctor sees and even imaging your new smile. Many of the smile enhancements that Dr. Peck, Dr. Schmidt and Dr. Peterson Boyle have done for their patients are displayed throughout the office to instill the confidence that you need when choosing a dentist for veneers, natural appearing fillings, or even routine cleaning appointments. 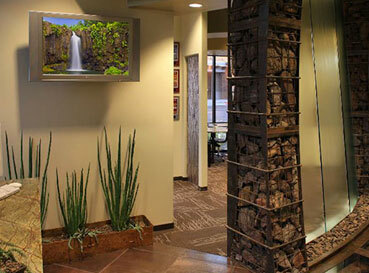 Our philosophy is to ensure the comfort of our patients during their visits to our offices. 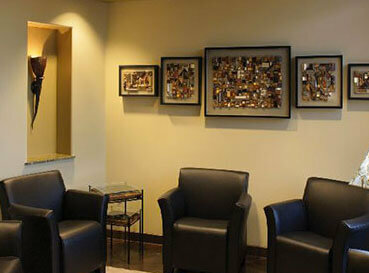 We offer cable TV in every room along with headphones for TV or music during dental treatments. We have an amazing massage chair for our patients during non-treatment times. We encourage our patients to enjoy a hand dipped paraffin wax treatment and, or hot rocks for your back or shoulders, to take you to a whole new level of care and caring. There are various types of lasers used in the office including the most recent development in lasers, the hyper speed C02 laser for periodontal pocket reduction, biopsies and much more. Other new laser technology available at Dental Studio 101 allows the doctors to detect decay at its earliest levels preventing loss of valuable tooth structure. You will also find that our sterilization procedures are state of the art featuring a hospital grade sterilization center.